Noeclassical design saw a return to a strictly logical use of classical architectural elements and was more or less taken from Greek and Roman Art. Neoclassicists valued the formal elements of line and form over colour. They designed colonnades and large structures, especially public buildings. Geometric forms such as the square and sphere were used. The most surprising form to be retrieved from the Greek past was the Doric – squat columns, absence of bases and austere entablature. 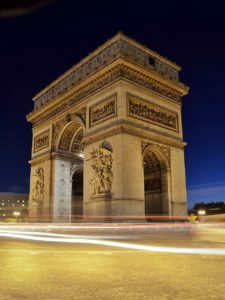 The Roman Triumphal arch was one of the main sources of neoclassical expression with its three-part division of four equal columns unequally spaced. The Arch of Constantine, Rome (AD.315) inspired the design and manifested itself in Luigi Cagnola’s Arco della Pace and the Arc de Triomphe du Carrousel (1806-08). The thermae window (twin – column trabeation surrounded by twin mullions) was also fundamental to neoclassical architecture especially in late 18th Century France. English architect Robert Adams studied the remains of antiquity with Charles-Louis Clerisseau; a French architecture noted for comprehensive planning, precise detail, polish and elegance- all qualities of Adam’s work. From imperial Roman architecture Adam derived a number of characteristic features – plans that set together a series of rooms of contrasting geometric shapes, freestanding interior columnar screens and made use of Roman interior ornamentation especially stucco mouldings and panelling, Adams use of such forms, along with Etruscan motifs, white figures, urns and garlands in low relief against a pastel background and numerous aspects of 16th century Italian Renaissance arch resulted in a personal antique style. 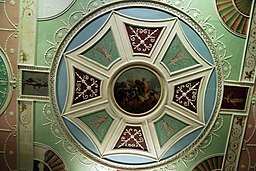 Syon House and Kedleston Hall illustrate his palatial style. There is rich colour, fine coloured and white marbles, gilt decoration with stucco and layouts influenced by the great Roman halls and baths. At Osterley and the library at Kenwood, the decoration is more delicate with the motifs nearer Greek origins; slender columns and pilasters and ceilings in pastel shades and white with arabesques in stucco. Diversity, lightness and intricate movement are all aspects of Adam’s art. He was known for wall moulding, mantle pieces, fanlights over doorways, ceilings in delicate relief often with a daisy shape in the centre and fan-like webs of garlands across each corner. His roman rooms show deeper colours – gilt and marble on pillars and flooring in black, dark green and terracotta’s as well as trick of screening off and apse or a shallow alcove with massive pillars. In general, neoclassic designs had symmetry and rectilinearly. Motifs were recognizable and antique inspired and often taken from Roman art – medallions, urns, vine scrolls paterae, sphinxes and tripods – arranged sparsely with broad neutral spaces and slender margins. Materials such as marble, agate, malachite and ceramics were used. 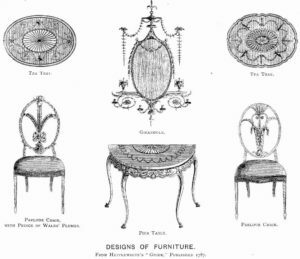 In furniture design designers gradually eliminated the numerous curves of the rococo style in favour of the straight outlines of classical furniture. Neoclassical artisans used thin pieces of plain wood arranged in geometric designs. Formal Greek motifs such as key-fret, wavebands, egg and dart ornament appeared increasingly as decoration to furniture, bronze mounts etc. The design of furniture at first kept its curves, but lines gradually became more severe. Legs of furniture – straight and tapering, sometimes fluted, symmetrical. In France the furniture was influenced by Greuze and Madame Vigee-Lebrun, in England Chippendale and George Hepplewhite, though it was Robert Adam who introduced the neoclassical style into the United Kingdom in the 1760s. Adam borrowed some of his ideas from the French style but he also contributed many original elements. He used delicate floral motifs, ram and ox heads, and other features inspired by ornaments on Roman Buildings and tombs. Adam introduced the sideboard, or credenza into English furniture. He also became known for skillfully blending furniture into the architectural plan of a room. A number of English furniture makers adopted Adam’s style during the late 1700’s. George Hepplewhite and Thomas Sheraton, prepared design books that popularized the style. The furniture made by Adam’s was very expensive. Hepplewhite and Sheraton simplified the designs to reduce the cost of the furniture for middle class buyers. Hepplewhite popularized oval and shield shaped backs for chairs in neoclassical style in mahogany instead of painted and gilded wood of the Louis Seize version. Low relief carving of swags, urns, ribands, and trophies decorated a great deal of furniture of the period. Inlaying was revived by Brothers Adam. Dressing tables with many drawers, rising mirrors and other mechanical complications were inspired by German cabinetmakers especially Roentgen. In contract vase forms were more severe, often with angular handles; forms related to Renaissance metalwork rather than ancient pottery forms with Wedgewood the only one to successfully copy the Greeks. The pastoral scenes and landscapes of Boucher gave way to more strictly classical themes and portrait medallions with added modeled ornaments in the form of swags, acanthus leaves and laurel; all symmetrically disposed and usually in gilt-bronze. In tapestry the influence of Boucher was apparent until the 1770’s because of the time necessary to weave large panels. The fashion was for allegorical and mythological subjects. A contributory factor to the decline of tapestry was the increase popularity of wallpaper. In 1785 Christophe Philippe Oberkampf invented the first machine for printing wallpaper and Louis Robert devised one for making endless rolls.